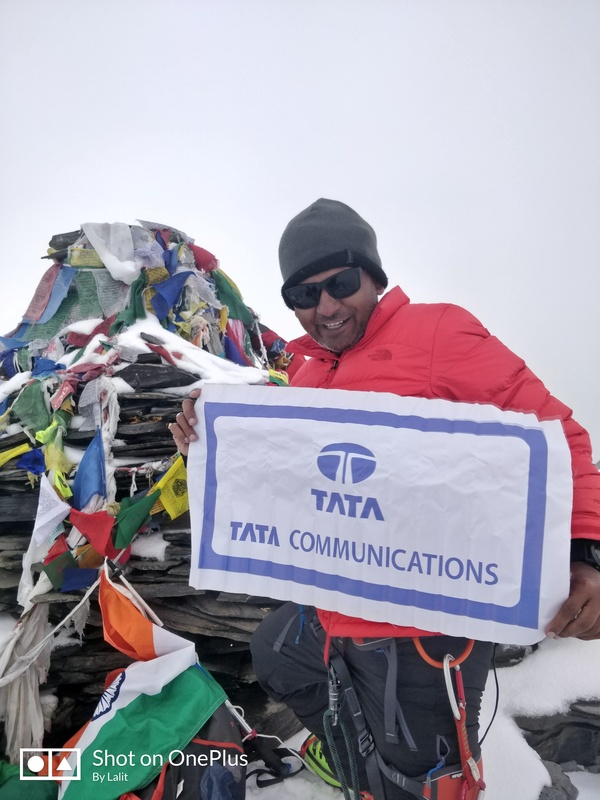 In my previous blog I talked about how my experience climbing the Kang Yatse II, a 6,250 metres tall mountain in the Himalayas, has given me perspective and helped me focus the task at hand. Now I will talk about how this experience has taught me to adapt and deal with challenging situations in my professional life. Have a plan and practice, practice and practice – but be prepared to improvise and adopt a plan B. No matter how well prepared you are, things can and will go wrong. What matters is the fortitude to adapt and be flexible when all else fails. About two days before reaching the base camp, we were at a place called Thachungtse (4,200m) when we experienced a cloudburst that washed away the kitchen and supplies. After a day’s hard climb, when we were looking forward to a hot meal to replenish our dwindling energy resources, we instead had to contend with a night spent shivering in soaked gear and survive on dried fruit and sweets. We had no choice but to patiently wait for help (in the form of another group) to arrive the next day which was our earliest opportunity for life sustaining supplies. The most important lesson learnt was that adaptability can sometimes become critical even to survival, especially since life rarely follows a roadmap and unexpected life events can happen anytime. At that time, fortitude to deal with the unexpected is critical. Be patient, respond quickly, move efficiently and remain steady as the world shifts around you. In work as in life, your inability to adapt, and instead holding on to closely held beliefs or plans can lead to redundancy or worse extinction. No matter how tough the going gets, and no matter how many disruptions happen, remember there is always a bright side. This time won’t come again and not creating lasting lifelong memories that make you smile will always be a regret. After all, nobody ever regretted ‘not being a grinch’. Times that test our limit, push our boundaries – especially when own reserves of patience and energy are low make us forget to look at the bright side. Being lost in the snowy wilderness with no end in sight was one such moment especially since it’s easy to start thinking of terrifying alternatives. However, recalibrating my own perspective to think logically and evaluate all possibilities instead of panicking, helped get out of a potentially life-threatening situation. It also helped me pause and appreciate the immense, unbelievable beauty in front of me (probably a once in a lifetime chance) and gave me renewed hope. Reflecting on my last summit to KYII and comparing it with the day-to-day reality of working in the technology industry, I can see many correlations between the two. Having the right technology to solve a customer problem is not enough – you need to have higher emotional intelligence, establish deep relationships and really understand customers’ challenges and how to overcome them, just like how you’d do with fellow climbers. As a leader, you need to have a plan – but be agile and adaptable, and change course quickly as conditions change. Crucially, you need to bring your team with you, empower them to succeed in their own way while always having their back. As the disruption caused by digitisation gathers pace across industries, attributes like resilience, agility and perseverance that were so crucial for the success of my KYII expedition are becoming crucial for not only business leaders, but also the very survival of businesses worldwide. If you missed it, you can read part one of my blog here. Never miss a story from Lalit Mishra, subscribe now.